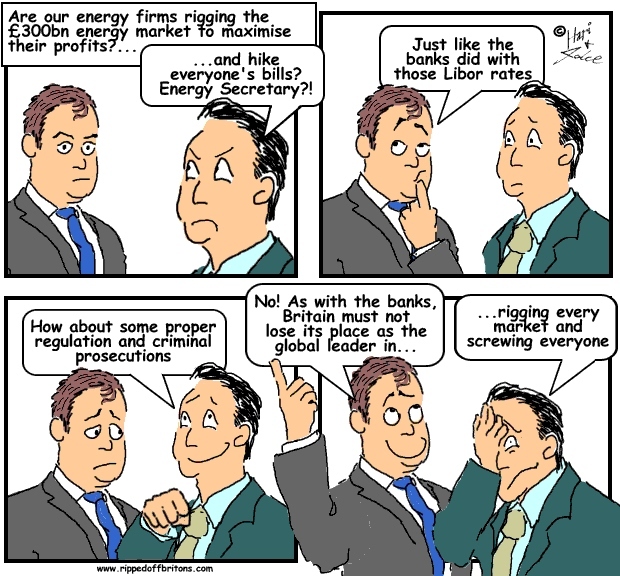 Energy price manipulation accounts for at least 50% of our bill rises? Are energy companies really forced to raise prices due to high wholesale prices? They do it because they can and will until they are penalised. Many consumers have to suffer as a result of the price hikes and it is usually the poor that suffer the most. The only thing that one can do it to search for the cheapest energy provider in the area to transfer to and save money. In the meanwhile lets hope the government also imposes a stiff penalty on those involved. The Guardian reports: "Gas market whistleblower sacked after accusing firms of price fixing ICIS Heren dismisses Seth Freedman, whose concerns over market movements triggered FSA and Ofgem investigations"